The two weeks of arts and cultural extravaganza was unveiled recently when the 5th Melanesian Festival of arts and culture was opened. The opening ceremony was staged at the Sir John Guise Stadium in Port Moresby. A few rumours have come in saying that participants from overseas are not being fed and housed properly. Sports Minister Hon Justin Tkatchenko MP has even gone to facebook to complain. He is quoted as saying "The Melanesian Arts and Cultural Festival was a absolute disgrace, mismanaged, and totally unorganized and was a embarrassment. PNG will welcome the Japanese Prime Minister Shinzo Abe next week for a two day visit. Abe, the leader of the world’s third biggest economy, will be accompanied by more than 150 business and government leaders. Prime Minister Peter O’Neill said he is looking forward to have discussions on a number of key issues, including trade, with the Japanese Prime Minister during the visit. Fiji-New Zealander Nina Nawalowalo and her husband, Tom McCrory, of the Conch Theatre in Wellington are leading a delegation of women actors from the Solomon Islands at the Fifth Melanesian Arts Festival in PNG. The head of the 2015 Pacific Games in Port Moresby says next year's event is a chance to showcase Papua New Guinea and break down stereotypes. 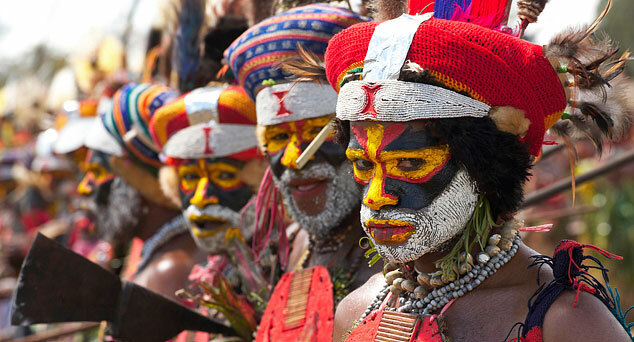 The CEO of the 2015 Pacific Games, Peter Stewart, says Papua New Guinea is a country that can do a lot more than dig things out of the ground and the Games is a chance for visitors to see what the country has to offer. InterOil Corporation has announced the sale of companies that hold its PNG oil refinery and petroleum products distribution businesses to Singapore-based Puma Energy Group Pte for US$525.6 million, which includes adjustments for cash and working capital. A district court judge has dismissed an attempt by the police commissioner, Geoffrey Vaki, to set aside an arrest warrant for the prime minister, Peter O'Neill. Prime Minister Peter O'Neill says he will continue in the top job despite a court lifting a stay on a warrant for his arrest. Mr O'Neill denies the allegation he authorised almost $30 million in payments to law firm Paul Paraka Lawyers, itself embroiled in a corruption scandal with the department of finance. Former judge Graham Ellis, who has been appointed to head the newly-established Interim Office Against Corruption (IOAC). He said he was keen to ensure that the IOAC would continue the fight against corruption. A Gogodala Longhouse built for the Melanesian Arts and Culture Festival has been said to represents a simpler time in Papua New Guinea. For something made of bush materials, it's quite huge - three stories high and about 30 by 40 metres - all made from wood and vines. Not a single nail. PNG's parliament website is offering greater public access to information about the parliament, its members and services. The website provides access to Hansard records of proceedings and debates, including records of attendance, voting, questions and discussions made in the chamber. Work on the Kookaburra flyover bridge at Erima in Port Moresby is about 35 percent done, according to construction company Hawkins PNG. "We apologise for any inconvenience during the construction period," Pardoe said. The work will relieve congestion in the airport ara of the NCD. Applications for grants under the Australia’s direct aid programme are open to Papua New Guineans. Those who want to make a difference in the development of this nation but do not have the means can apply for a grant through the office of the Australian High Commission in Port Moresby. Interested in the Pacific? What about Papua New Guinea? Gulf Christian Services invites applications from Medical Officers for positions at Kikori Rural Hospital in the Gulf province. A PNG side has defeated an Australian team made up of Roosters SG Ball members 22-8 in the gold medal match at the inaugural under 19s Championships played at Broadwood Stadium in North Lanarkshire, Scotland. It was an officially endorsed event by the Commonwealth Games Federation and included a wide-spread representative number of Commonwealth countries: Australia, Papua New Guinea, Wales, Scotland, England, South Africa, Jamaica and South Africa.